Strata ... sustainable protection for flooring. Hempel says its new flooring coating range Strata includes a choice of self-levelling systems that provide a perfect solution for abrasion-resistant and seamless concrete surfaces. Among them is Strata Epoxy SL2000, a self-levelling, solvent-free, three-component epoxy paint system suitable for a wide range of purposes. “Designed primarily for concrete substrates where a seamless flooring surface combined with excellent mechanical properties is essential, Strata Epoxy SL2000 is ideal for a diverse range of floorings, including hospitals and other hygienic applications,” said a spokesman for Hempel, which provides a wide range of products for the protective, marine, container, decorative and yacht markets. It can be applied from 1 to 3 mm dry film thickness (DFT), depending on the requirement. Strata Epoxy SL5000, a ‘sister’ product, is almost identical to SL2000, though it can be applied to a dry film thickness up to 5 mm. The spokesman pointed out that Strata has been developed based on its 100 years of experience in producing protective coatings and when used as a final coating surface in industrial environments, its unique toughness as well as exceptional durability provides the ultimate sustainable protection for all concrete flooring. Strata also provides various solutions for parking areas, racetracks, warehouses, asphalt marking, factories, stairs and even aircraft hangars. Elaborating on what gives the product its key attributes, the spokesman said the Strata range has as its main ingredient epoxy polymers. Polymerisation reaction of the epoxy compounds with the hardeners (curing agent) forms a cross-linked polymer, often with high mechanical properties, temperature and chemical resistance. Epoxy has a wide range of applications including coatings. “Epoxies are known for their excellent adhesion, chemical and heat resistance and good-to-excellent mechanical properties. This coupled with high reactivity, makes them important materials for industrial applications. “In general, uncured epoxy resins have poor mechanical, chemical and heat-resistant properties. However, good properties are obtained by reacting the linear epoxy resin with suitable curatives to form three-dimensional cross-linked structures. The reaction does not result in the emission of water or emancipation of any by-products making volumetric shrinking very low (less than two per cent) and thus the resin acquires high mechanical properties as well as high durability due to its cross-linked polymer form,” he explained. 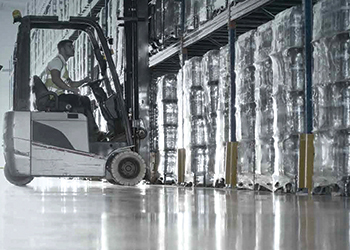 The self-levelling epoxy of the Strata range produces a highly-functional floor coating that affords excellent protection against chemical abrasion and has impact resistance. It is suitable for a wide range of floors in warehouses, factories, laboratories, kitchens, hospitals and hygienic purposes and can be applied from 1 to 5 mm dry film thickness, depending on the requirement. Hempel is continually investing in research and development (R&D) and is committed to providing aftersales services to match the quality of its products. “Continuous investment in R&D is something that Hempel has been renowned for since its inception; it applies cutting-edge technologies and processes to provide its customers with the finest products available anywhere. The company’s extensive product range is also backed up by bespoke after-sales services. “This investment in R&D runs into millions of dollars to acquire the latest technologies and equipment, as well as hiring the world’s most accomplished chemists to develop new products. It is what makes Hempel the market leader in painting technologies,” the spokesman concluded.